The bridge, which was built in 1969 and has been classified as “structurally deficient” since 1995, is one of 250 the state is scheduled to be replaced in Rhodeworks. 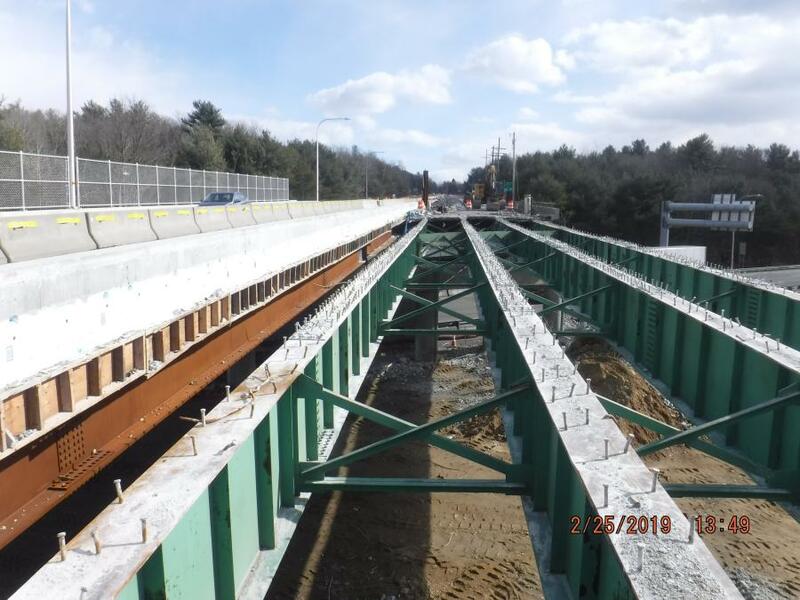 Reconstruction of the Victory Highway Bridge, which carries Victory Highway, Route 102, over Route 95 in West Greenwich, R.I., started in Nov. 2017 and is in its second phase, with half the bridge having been demolished and rebuilt and the second half under way. The bridge, which was built in 1969 and has been classified as "structurally deficient" since 1995, is one of 250 the state is scheduled to be replaced in Rhodeworks, its 10-year transportation program, according to Esam Eid, the Rhode Island Department of Transportation project manager. The budget for this job is $19 million, with 80 percent to be paid by the federal government. Eid said the north side of the bridge has been completed and the entire job should be done by the fall of 2020. Beta Engineering, Lincoln, R.I., is the design firm on the job and the John Rocchio Corp., Smithfield, R.I., is the contractor. 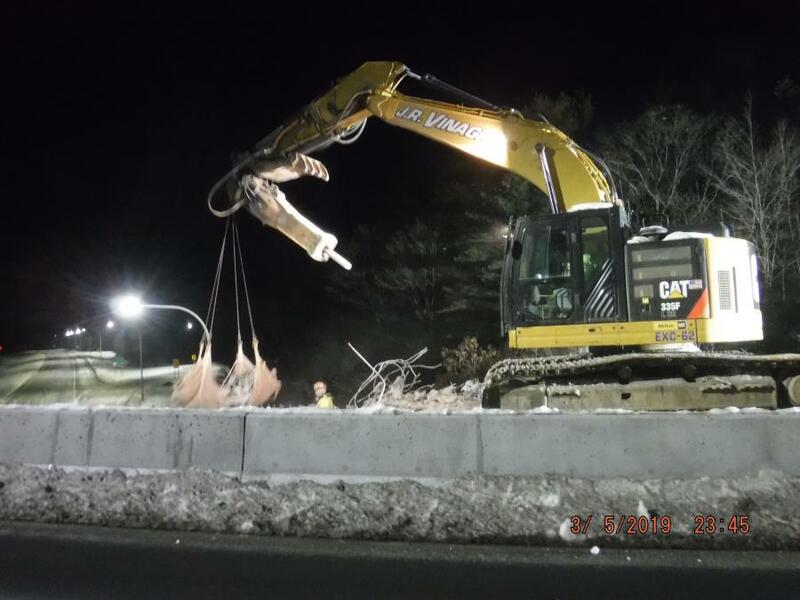 Paul Cappelletti, JRC's project manager, said, "We demolished the first half of the old bridge and rebuilt that side with abutments and piers to carry steel beams and the concrete deck. Phase one was completed up to paving at the end of January." The equipment used on the job included a large excavator with a hydraulic hammer to peel back the deck. 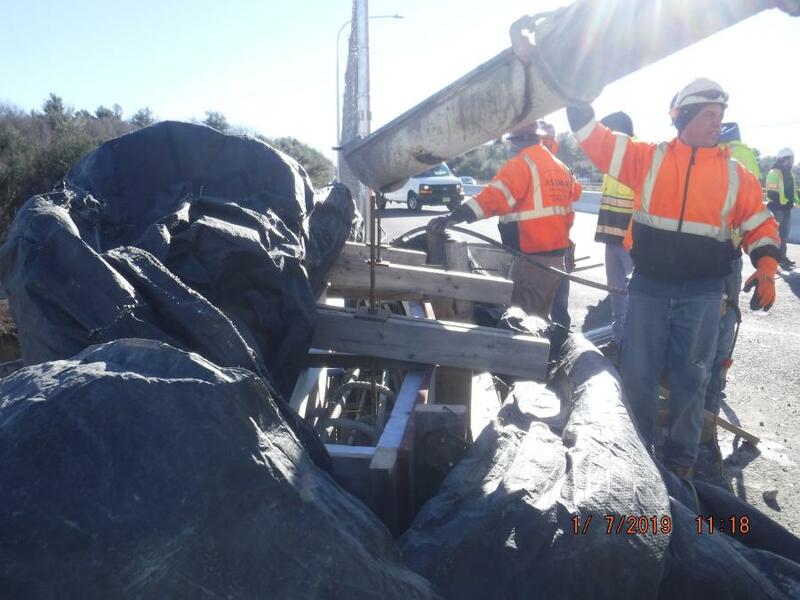 A subcontractor used a skid steer to push the broken concrete deck back and peel it to the end of the bridge and a hydraulic hammer to break it up further and a large excavator to break the deck into smaller pieces, Cappelletti said. 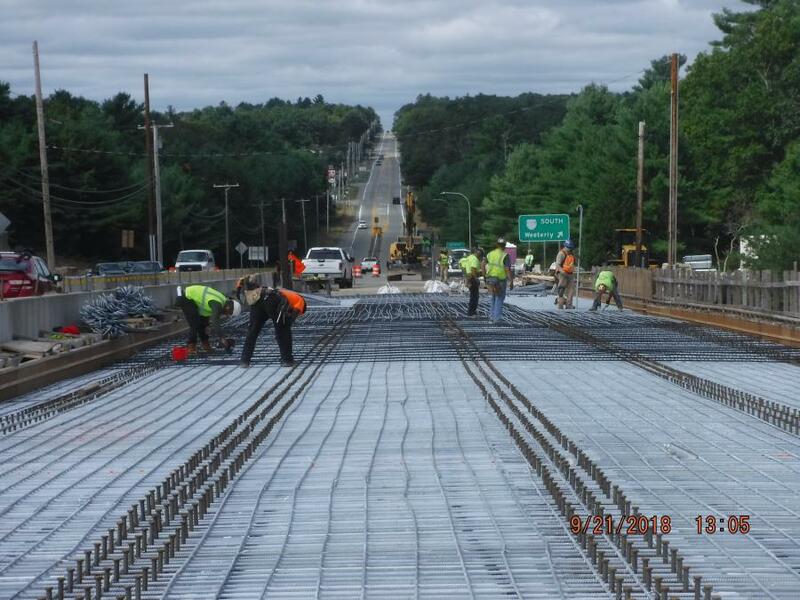 He said cast-in-place concrete was used on steel beams for the bridge deck. A crane sitting below Route 95 was used to erect steel beams on top of bridge abutments and piers. Traffic has been maintained during construction. "There is a median barrier in the middle with all traffic on one side with a work zone on the other side," Eid said. There will be median work to do after the second half of the bridge is rebuilt and paving, Cappelletti said. JRC experienced difficulty early in the job with earth support. "The ledge was higher than we anticipated so we had to augur rock sockets in the ledge with steel piles and we drove steel plates in between the piles with a vibratory hammer into the soil," Cappelletti said. "It was a different process on one side of the bridge because of the ledge height." But he said the job has gone relatively smooth and will be completed according to schedule. He also said when the job is complete lanes in both directions will be a little wider than they are now. "We started the second half of the job in February. The tasks for both phases are almost identical," Cappelletti said. "We'll demolish the old bridge and dig down to put in new abutments and piers." 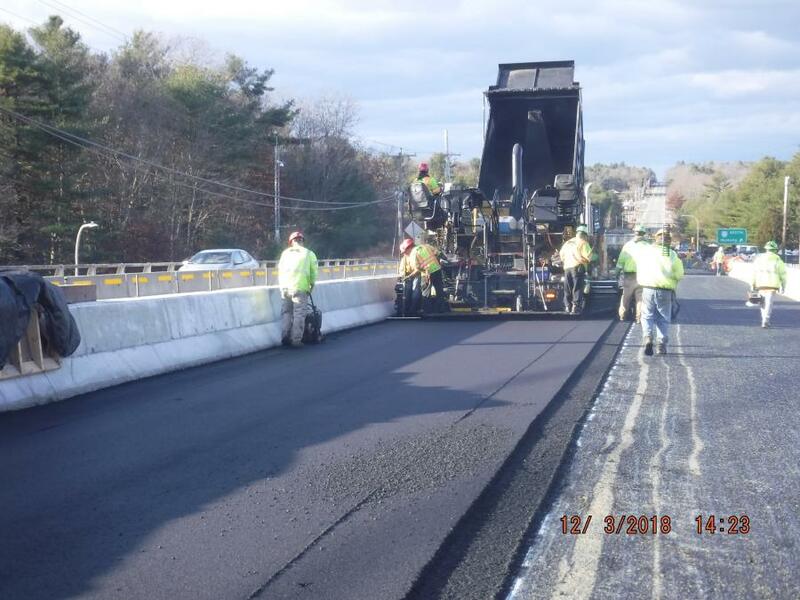 Crews will resurface Route 102 ramps, replace signing, striping and guardrails and complete minor landscaping and draining work to complete the project. Less than 9,000 vehicles a day cross the Victory Highway Bridge. "It's not a high-volume roadway in the rural part of the state," Eid noted.